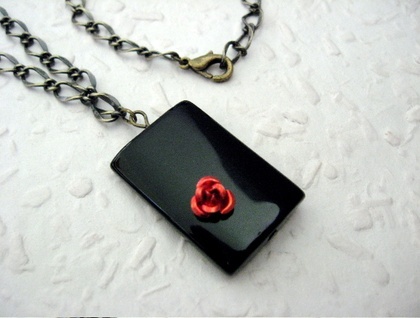 A tiny, scarlet, aluminium rose is mounted on a cool, smooth slab of gleaming jet black onyx. The chain is an antiqued-brass coloured, hammered Figaro-curb chain. A simple, but very dramatic pendant. The lobster-claw clasp can be clipped on at any point on the chain, making this necklace highly adjustable. It looks beautiful worn just below the collarbones. The necklace measures 52cm, including the clasp. 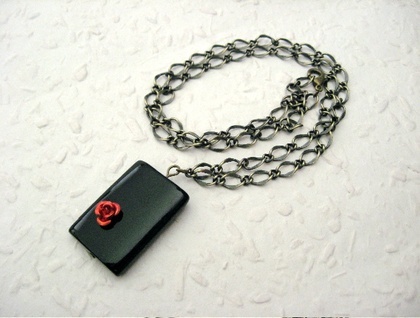 The semi-precious onyx rectangle is 30mm long. Silverlight Jewellery – exquisitely eclectic.